The time of leaves and flowers is over for another year. Now that the fall rains have come, it is the time of fungus. Last summer, I blew a coworker’s mind by telling her that fungi are not plants. “Well, what are they then?” she asked. They’re fungi. They belong to their own taxonomical kingdom, like animals and plants. They don’t make their own food with energy from the sun, like most plants. Fungi’s job is to digest organic material, and that’s how they get energy. 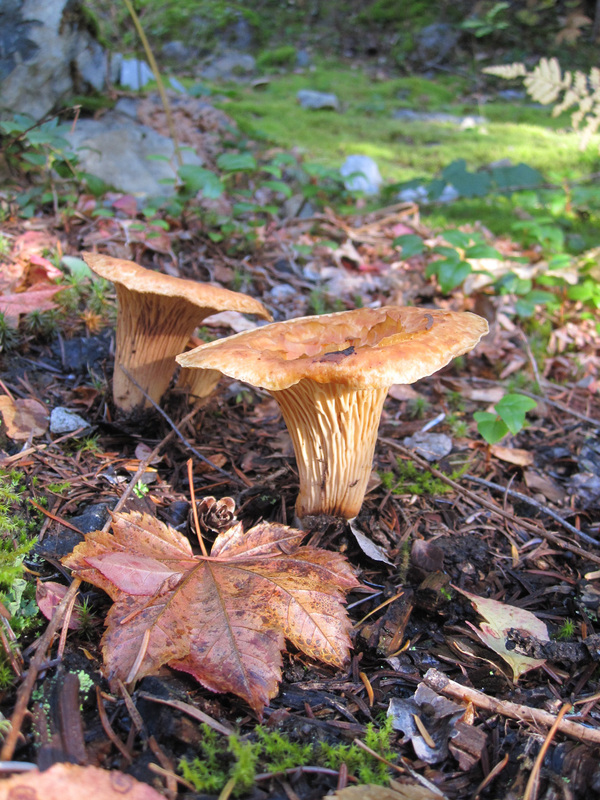 The Pacific Northwest forests are home to a dazzling array of fungi. Without them, there would be no decay, and the woods would be piled high with branches, twigs, needles, tree trunks and all manner of plant detritus. Most of the fungi’s work takes place out of sight underground. Their hyphae are similar to the roots of plants, working their way through soil and wood. This working breaks down the plant material into smaller and smaller component parts, eventually returning nutrients to the soil which can then be used by living plants. Nothing goes to waste in nature. The “circle of life” has become a dreadful cliche, but it does describe how organisms live in the woods. Mushrooms are the fruiting bodies of fungi. They pop out of the ground in the fall when conditions are cool and damp. The gills open and spores are released, making possible the next generation of fungi. I have been enjoying the variety I see while hiking at work–so many sizes and shapes and colors. Some are nibbled on by mice and squirrels. Others turn to sludge and melt back into the ground. There can be no renewal without decay.